GCI Outdoor was founded in 1996 by Dan Grace who wondered “Why isn’t there a chair for this?” The first product was the Everywhere Chair, and the company has grown from there. They have six patents and ten more pending. They have numerous chairs for every type of situation and have branched out to make two folding tables and two cook stations. Their website is easy to use and clutter free. The GCI Outdoor Master Cook Station is the perfect addition to any car camping, picnic, or tailgating event. 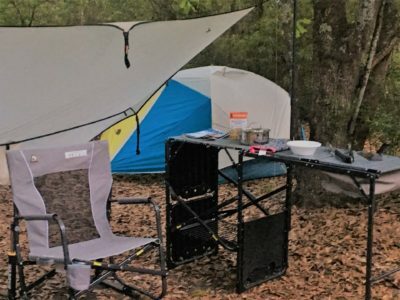 It features GCI Outdoor’s patent-pending Slim-Fold Technology that allows it to fold down into one piece for easy set up and transport. The Master Cook Station is filled with features including an extended aluminum tabletop that measures 56” long and 15.5” wide, three fold out multi-use plastic side tables that are 14” long by 15” wide. Each side table has beverage holders, a paper towel holder and even a trash bag hook. There is a lantern pole, and even a sink to wash dishes. There is a wire storage area under the aluminum tabletop. According to GCI Outdoor the Master Cook Station weights 23 pounds and retails for $120. I like organization and I find it lacking when I car camp. At state parks there is usually only a single picnic table and I usually try to park my truck where I can use the tailgate, but I still lack space. I think the Master Cook Station will fill a niche for me and help me have a more organized campsite. When it arrived, I opened the box and put it together without reading the instructions. It is a simple design, and I had it put together the first time in about three minutes. 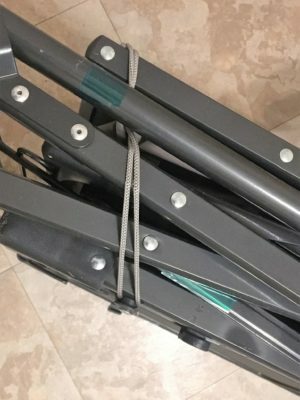 It basically unfolds and the wire storage rack locks the main portion of the table in place, and then I fold out the extended table top portion and the legs. After that I am able to fold out the side tables as needed. 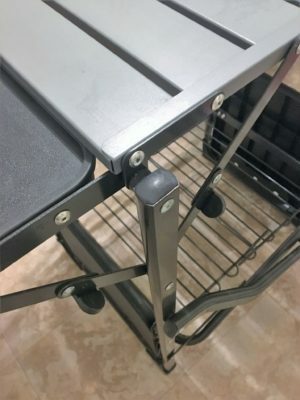 Each of the tables and the leg supports have a lock to hold them firmly in place and a thumb tab on the supports to easily release the supports to fold the tables and legs up. GCI Outdoor thought of everything by including a rope loop and a knob that keeps the cook station flat when folded. I will look for the following characteristics while reviewing the Master Cook Station – organizational/usefulness and durability. Does the Master Cook Station help me better organize my campsite or does it just take up space? Is the cook station durable? Will it hold my stove, cooking gear, pots? The side tables are plastic – do they hold up to constant use? These are just a few of the questions I will consider as I review the Master Cook Station. 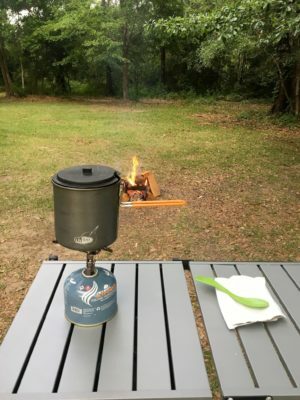 I have used the GCI Outdoors Master Cook Station on a weekend camping trip to Grand Isle State Park, LA, and on four trips to Buccaneer State Park on the Mississippi Gulf Coast. In addition, I have used the Master Cook Station at home when we have had folks over, and on picnics in City Park in New Orleans. Temperatures have ranged from comfortable 60s to unbearable 90s with high humidity. I have experienced some typical late afternoon thunderstorms that come with summer in the south. I mentioned in my initial thoughts that I would evaluate the Master Cook Station on organizational usefulness and durability. The Master Cook Station had everything I want in a food prep and camp organization perspective. The main aluminum tabletop provided plenty of space to set out my ingredients to cook any meal. 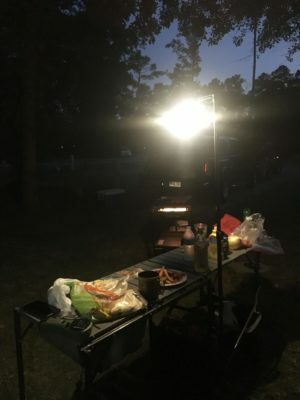 While in Buccaneer State Park, I was able to lay out venison sausages for grilling, all the needed condiments and buns, and still have enough room to peel and cut up rainbow carrots into sticks. 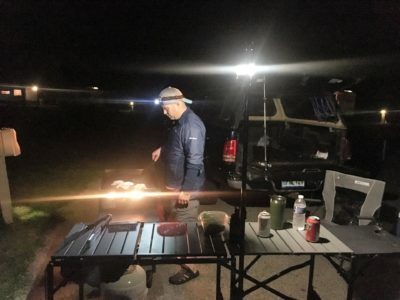 I also found that I had plenty of room to cook with a single burner camp stove on one end of the tabletop while keeping my prep gear and other essentials on the other end. The plastic fold out tables also added to the organizational experience. I was able to fold out one to hold drinks, utensils and paper towels or fold out all three to store various camp kitchen tools when they were not in use. The wire rack in the center of the table underneath the tabletop became my go to storage spot for larger items. I kept the Sam’s size chip box and paper good stored in this area. The lantern pole was easy to use and handy. I used it while preparing dinner at night and I never bumped into it while cooking. I never had any slippage from using the click lock. However, I only used smaller battery operated or rechargeable lanterns rather than the classic Coleman Propane Lanterns. I also found that I need to be careful opening the entire table. If I chose to pull the table open on the side with the lantern pole there is a chance that the pole will hit me as it rises when I pull the table open. Just something to be aware of. The Master Cook Station has a section of the aluminum tabletop that folds back to reveal a sink. I never used it. I try to use paper goods and grill food with my Blackstone Griddle so there were never any dishes to use. Durability is the second characteristic I am evaluating the Master Cook Station on. All of the hinges operate as smoothly as when the Master Cook Station arrived, and that’s even with me storing it outside in a covered porch when not in use. The tabs to lock the hinges still operate easily. The aluminum tabletop shows no signs of wear and is easy to clean. Overall, I am very pleased with the durability of the system. Thanks for reading my update. Please check back in about a month for my final update. 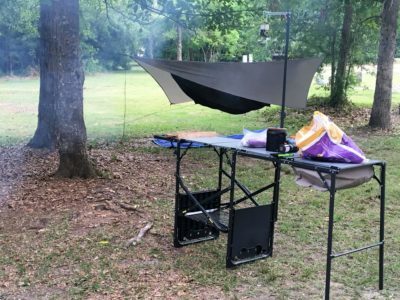 Special thanks to 4alloutdoors.org and GCI Outdoor for supplying the Master Cook Station for this review.